What does it mean to franchise something? It means to take an artifact — a successful suspense novel, say, or an action movie — and mass-produce it by replicating the obvious parts while throwing away the challenging and unique bits. The audience gets a comfortably familiar entertainment product, the studio gets a reliable source of profits, and no one much cares if any soul is lost on the way. Larsson isn’t around to complain — he died in 2004, before his three Lisbeth Salander novels had been published and before the Millennium Trilogy became an international literary sensation and the source of two film versions, the first a Swedish trilogy starring Noomi Rapace and the second a 2011 Hollywood one-shot starring Rooney Mara. Based on a 2015 novel by David Lagercrantz that continues the saga, “Spider’s Web” casts Claire Foy as Salander, the tattoed, pierced, and leather-clad angel of vengeance. Foy is best-known as the young Queen Elizabeth II on TV’s “The Crown,” and her Janet Armstrong is one of the finest things about the current “First Man.” As Salander, though, Foy squeezes any remaining vulnerability from Larsson’s punk heroine and just gets down to action-movie business. Her Lizbeth is small, dynamic, humorless, and, to be honest, fairly dull. But she more than holds her own in the chases and fights, and she scurries from plot point to plot point with grim determination. Where Larsson’s original Millennium Trilogy had Salander visiting revenge on an older generation of male sexual abusers — the sins of the fathers — “The Girl in the Spider’s Web” only feints in that direction before settling quickly into a disengaged genre rut. There’s a scientist (Stephen Merchant) with some doomsday software that Lizbeth is hired to steal, a Teutonic villain who steals it from her, a sleek Swedish intelligence officer (Synnove Macody Lund), an American interloper from the NSA (Lakeith Stanfield), and, of course, Salander’s journalistic Boswell, Mikael Blomkvist, played by Sverrir Gudnason with not nearly as much to do as Daniel Craig or Michael Nyqvist in the earlier movies and about a quarter of the panache. Why is Stanfield, the loosey-goosey eccentric from “Atlanta,” “Get Out,” and “Sorry to Bother You,” even in this movie? Probably for the same reason Foy is — to try his hand at an international action flick, and why not? Yet the direction by Fede Alvarez and the screenplay by a trio of writers lets the actors down by turning what was once fresh and darkly urgent into flavorless B-movie sausage. The action scenes are professionally filmed yet perfunctory. There are too many shots of characters scowling at computer screens, perhaps wondering which app programmed this movie. Anything that was interesting about Lisbeth in the original narrative — her photographic memory, for instance — has been written out. As of “Spider’s Web,” she’s just another glowering vigilante superhero packaged for maximum consumption on airplane flights and downstream video. Granted, she’s a butch female vigilante superhero. I guess that’s progress. In the end, it’s a toss-up as to what’s the greater sin: bleeding the individuality out of one of the more interesting fictional creations in recent pop culture, or wasting the talents of Vicky Krieps, who stole “Phantom Thread” right out from under Daniel Day-Lewis, by casting her in the embarrassingly underwritten role of the journalist’s editor-lover. 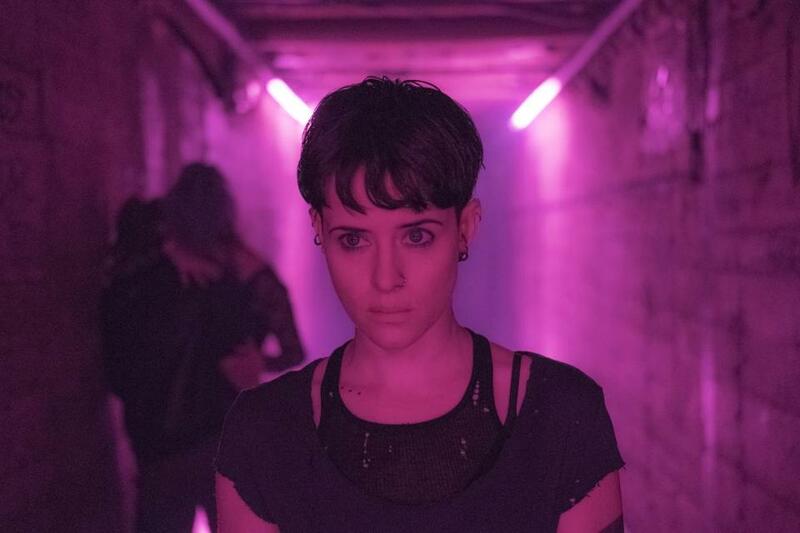 In its climactic scenes, “The Girl in the Spider’s Web” almost seems to invite derision by suggesting a family grudge behind the story line’s suspenseful race to nuclear Armageddon. It’s not spoiling much to say that this movie might be the damnedest version of “Frozen” you’ll ever see. “Someone has to carry the pain,” a key character says to Lisbeth late in the going. “Now it’s your turn.” Actually, it’s ours.